Eloise Pepion Cobell (1945 – 2011) was a Native American tribal elder in the Niitsitapi Blackfoot Confederacy. She was also known as the Yellow Bird Woman. In addition to her prestigious role in the tribe, she led an active and engaging life as a banker and rancher. 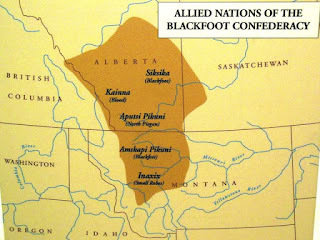 The Niisitapi (Blackfoot) people lived in the Northern Plains that occupied territory in the region that is now parts of Canada and the United States. Their history in the region is a long and involved (see images below). 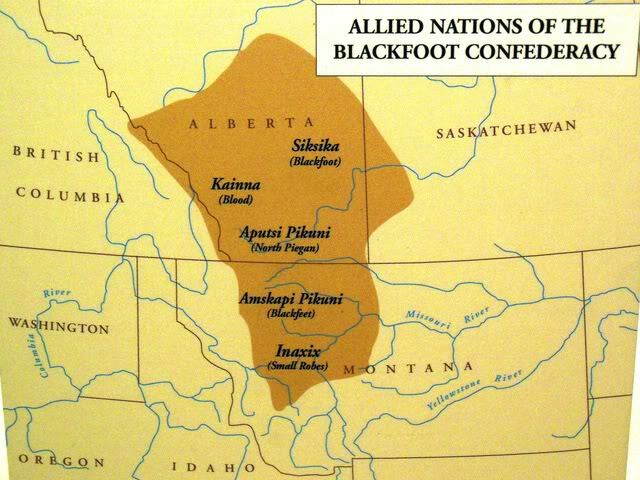 The Blackfoot Confederacy represents a conglomerate of four so-called, “First Nations” - Siksika (Northern Blackfoot), Kainah (Blood), South Pikuni (Piegan, located in Montana), and North Pikuni (Peigan, located in Alberta). All of these nations share a common language and heritage. Traditionally, they had a way of life centered around buffalo hunting. The South Pikuni reside in Montana and the North Pikuni reside in Alberta, Canada. Tragically, there was a fifth group called the Small Robes that is no longer extant – the members of this group were wiped out by the smallpox epidemic of the 1830s. “Plains Indian culture was steeped in religion and ceremony. The world was an uncertain place, and people needed the help of supernatural powers. Help was obtained from the spirit world in the form of visions and dreams. In these dreams people were instructed in the use of sacred objects, songs and rituals. These objects and rituals became part of the sacred Medicine Bundles. Cobell was born on the Blackfeet Reservation in Montana. She had eight siblings and was the middle child. 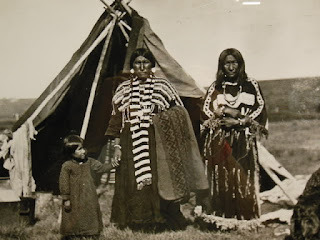 Her great grandmother was Mountain Chief one of the esteemed leaders of the Blackfeet Nation. She grew up on her family’s cattle ranch in harsh conditions without the benefit of electricity or running water. In spite of the poverty of her upbringing, she attended Montana State University but had to curtail her education to care for her dying mother. Following her mother’s passing, she moved to Seattle where she met and married Alvin Cobell a kinsman. They had one son, Turk Cobell. Ultimately, she returned to the reservation to assist with the management of the family ranch. She soon became treasurer for the Blackfeet Nation. This suit stems from the General Allotment Act of 1887 mandating that Indian reservations be divided into parcels for individual rather than collective ownership. The government than determined that many allottees were not capable of managing their own lands. As a consequence, the Department of the Interior (DOI) held these lands in trust, resulting in leasing the allotments for agricultural or mining activities. The revenues from these leases and royalties were supposed to the placed into individual Indian money accounts (IIMs) by the Bureau of Indian Affairs (BIA) to be paid to individual land owners. It is the management of this distribution that was effectively challenged in the suit. Finally, the suit was successful and a settlement was reached with the government. In response to this settlement, Cobell said that, “"Although we have reached a settlement totaling more than $3.4 billion, there is little doubt this is significantly less than the full accounting to which individual Indians are entitled. Yes, we could prolong our struggle and fight longer, and perhaps one day we would know, down to the penny, how much individual Indians are owed. Perhaps we could even litigate long enough to increase the settlement amount. But we are compelled to settle now by the sobering realization that our class grows smaller each year, each month and every day, as our elders die and are forever prevented from receiving their just compensation." Without Cobell’s unrelenting determination to right a grievous wrong done to her people, the injustice may have never been recognized and finally corrected.